Prof. Brad DeLong in an article earlier this week made a bold claim: that “US trade agreements have not substantially harmed manufacturing employment. Period.” I am making the equally bold claim that he is wrong. There are at least two major points in his article that I believe are plainly incorrect. …. One possible baseline, given how many people hold up Germany as a model for the way it has protected its manufacturing, is to assume that under the best policies, the US would have matched Germany. It would have shed about 50 percent of its manufacturing job share since 1971, rather than the 62 percent that we did shed. That would have given the US today manufacturing employment equal to 12.2 percent rather than 8.6 percent of nonfarm employment. That represents a gap between reality and one theoretical alternative world of 5.4 million manufacturing jobs. Call that the excess shrinkage of US manufacturing. integration of Soviet East Germany into the unified country. Take that away and the experience in the two countries isn’t even close. Since 1995, Germany has only lost about 10% of its manufacturing jobs. The US at its worst after the Great Recession lost over 1/3 since 1995. To be fair, DeLong does mention the integration of East Germany into the whole, but he never explains why this doesn’t spoil his comparison. What Germany did wasn’t on par with NAFTA. It was on par with admitting Mexico as a state in the US! Yeah, I think if Mexico were admitted as a US state, manufacturing employment in the newly united whole would be a lot lower. When those artificial supports for bad businesses disappeared, did East Germany’s workers move on to more productive work? Yes, most of them did. Many moved to West Germany and its more robust economy. Some, however, did not. And enough wound up on the dole that the sociological aftershocks are still being felt today: Even 25 years later, unemployment in the former East Germany is 3 percentage points higher than unemployment in the former West Germany. But consider this too: An East Germany that was only 40 percent as well off as West Germany in 1989 is now 80 percent as well off as West Germany. It is very hard to say that the shedding of inefficient, unproductive, and low-wage manufacturing jobs was a minus for East Germans. In the first place, those 3% additional unemployed might disagree with you. But to return to my Mexico analogy, if 20 years after admitting Mexico as a US state, Mexico had improved from 40% to 80% as well off as the pre-existing US isn’t the issue. The issue under this circumstance is, whether or not the pre-existing US was better off. In other words, take East Germany out of the equation, and focus solely on the areas of former West Germany, and maybe you’ve got a point. 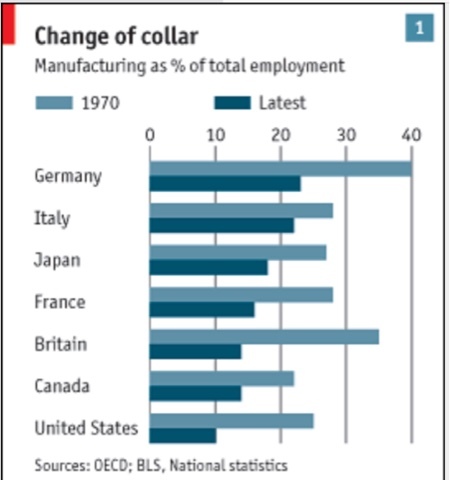 Italy, France, Japan, and Canada all have had far less a loss of manufacturing jobs than the US. Bottom line: That 2/3’s of the loss of manufacturing jobs in the US is in excess of Germany is strong evidence that Germany has NOT had the same pattern as the US. It actually undercuts Prof. DeLong’s position. seemingly forever lost (! ), is that most all today’s $10/hr US jobs (e.g., Walmart cashier) could plausibly be paying more like $20/hr — with German level union density. Given that 45% of today’s US workforce is earning $15/hr or less this seems to make debating about a few percent more or fewer manufacturing jobs far from the most relevant show. And don’t forget health care looks like the next manufacturing — even spread everywhere and eventually government funded. You can’t get something from nothing but, believe it or not, the money is there, somewhere to make $10 jobs into $20. Bottom 45% of earners take 10% of overall income; down from 20% since 1980 (roughly — worst be from 1973 but nobody seems to use that); top 1% take 20%; double the 10% from 1980. Top 1% share doubled — of 50% larger pie! One of many remedies: majority run politics wont hesitate to transfer a lot of that lately added 10% from the 1% back to the 54% who now take 70% — who can transfer it on down to the 45% by paying higher retail prices — with Eisenhower level income tax. In any case per capita income grows more than 10% over one decade to cover 55%-to-45% income shifting. less (mostly gone) poverty = mostly gone crime and its criminal justice expenses. IOW, labor unions = a normal country. Germany’s trend is the same as every other country you list, including the US. This reminds me of climate change deniers who refuse to look at trends in climate models. Why not start in the 1950s? From 1953 to 2010, the US lost .4 % of Manufacturing workers a year. Go find huge declines, other than recessions where this was not constant. Of course trade has an effect. to think it is the largest is silly, as silly as counting numbers of workers while comparing a country of twice the size. From 1953 to 1963 the % of workers in manufacturing fell 4.7%. From 2000 to 2010 the % of workers in manufacturing fell 4.2%. This is way beyond my pay grade to figure out the effects on this topic, but I remembered Dean Baker mentioning it numerous times. pk, DeLong and several others lately are into debating with no referee. DeLong used an equivalence that supported his hypothesis but is disputable as to relevance. Called False Equivalence fallacy. Being in a hurry I toss out an observation: the manufacturing sector in the US is changing beyond machines, robots and Lean used to be original equipment manufacturers made a lot of the things they assembled into marketed product. Now a lot of components are made in sub contracted specialty manufactories. I saw this trend in DoD suppliers. DoD suppliers don’t go to Mexico for parts like the big 3 auto manufacturers have since NAFTA. Aside from equivalence, the argument for automation being the culprit does not account for demand growth satisfied by imports. It is an argument looking for support using deductive reasoning when all the impacts are affected by cognitive bias. It is not self evident that a decline in manufacturing employment is only due to trade. In the US both trade and productivity have contributed to the decline in manufacturing employment. But the very fact that manufacturing output has grown in the US at the same time that manufacturing employment fell implies that productivity accounted for the bulk of the decline in manufacturing employment. For the last quarter century US manufacturing productivity was significantly stronger than manufacturing output. What has been the growth rate of German manufacturing productivity and how does it compare to manufacturing output ?